In the coming days, much of the coverage of the Chernobyl disaster in Russia is likely to focus on the 30-year anniversary and commemorations of it. The same may be said of reporting in Ukraine and Belarus, countries directly affected by the ramifications of Chernobyl. Fewer are likely to examine the current state of nuclear energy in these countries or their industries’ enduring weaknesses and defects — let alone advancements in terms of safety. Several decades after a disaster as critical as this one, it is important to question why a viable narrative for a post-nuclear Russia, let alone a post-nuclear Ukraine or Belarus, has failed to gain traction and support in a region blighted by its nuclear heritage. Most of the commemorations and coverage surrounding the Chernobyl anniversary are likely to overlook those in Russia advocating and fighting for such a narrative to win acceptance in society, as well as the difficulties and dangers they must endure in doing so. Indeed, never has challenging the nuclear industry and societal consensus in Russia been so difficult or dangerous: activists find themselves squeezed within a political environment heavily supportive of nuclear energy, while also operating amid escalating anti-NGO repression and rhetoric. Ecodefence! is one such organisation. Founded in 1989, Ecodefence! is known for its successful campaigns to end the import of radioactive waste to Russia and the construction of nuclear reactors in Kaliningrad among other regions. In 2014, Ecodefence became the first ecological organisation in Russia entered into the register of “foreign agents”. This was done at the order of Russia’s Ministry of Justice due to the organisation’s “opposition to the construction of nuclear power plants”. As part of oDR’s coverage of the 30th anniversary of the Chernobyl disaster, we contacted Vladimir Slivyak and Nailya Ibragimova, two prominent anti-nuclear activists with Ecodefence!, to talk about their perspectives in the age of post-Chernobyl anti-nuclear activism, and particularly their Chernobyl+30 campaign, a new plan to raise awareness among young people in Russia. oDR: What challenges are faced by today’s generation of anti-nuclear activists in Russia? How has anti-nuclear activism changed since the 1990s? Vladimir Slivyak: It’s quite a large difference. At the start of the 1990s, there were many more people involved in a wider variety of activities. The government and nuclear industry were in crisis, they weren’t building new power plants. By the 2000s, the movement had shrunk and become less active, though possibly more successful. Regardless of its decline, the ecological movement played a significant role in halting the construction of at least two large power plants — one near Murom in central Russia, and another in the Kaliningrad region. As these projects would have cost approximately 15 billion dollars, this was a serious blow to the nuclear industry. They also stopped the import of radioactive waste from western Europe by several Russian firms. Nailya Ibragimova: The Russian government’s pressure on ecological movements has increased over the past ten years. In 2012, a law was passed on “foreign agents”, a category which included practically all organisations that criticised atomic energy. Today, ecological movements are under serious threat from the government, which has a strong interest in the development of atomic industry and the construction of new nuclear power plants in Russia and abroad. Trusting in God at Volgodonsk nuclear power station, 2009. Photo CC: Sergey Venyavsky / Visual RIAN / Commons. 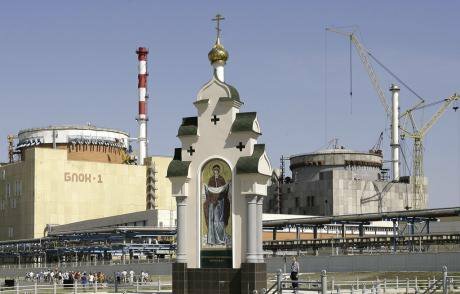 Some rights reserved.Slivyak: Atomic energy has practically become an instrument of political power for the Russian authorities. It is used in expanding Russia’s international influence and in the fight against international sanctions. So, despite sanctions, the Russian government has offered a number of European states to construct new nuclear power plants, promising to pay for these projects from Russia’s state budget. When it’s said that atomic energy is not a political issue, that’s complete nonsense. As ecological groups interfere with these plans, they come under serious pressure from the state. We recently published a report, The Imitation of Success, which details the activities of the state energy company Rosatom. It also deals with many of these questions. oDR: What civil initiatives could be the most effective for drawing attention to issues surrounding nuclear energy? What key questions are most likely to raise interest among the public and politicians, and to what extent? Slivyak: There is quite a clash in positions on atomic energy — on the one hand, activists believe that nuclear power plants are unacceptably dangerous, that they simply should not be built and that the money would be better spent on developing renewable energy. The authorities, on the other hand, want to develop nuclear energy whatever the conditions. There cannot be any cooperation; these positions are too well-entrenched and cannot be changed. Activists are defending the public interest, and as such cannot change their position, as that would be a betrayal of Russian citizens. However, the position of the authorities can gradually change — due to rising costs and opposition from the population, they will eventually have to decommission old nuclear plants. And when that happens, questions about the disposal of nuclear waste — and about nuclear power in general — will arise. Both options are very costly, and will be paid for by the taxpayer. The technology to safely isolate nuclear waste while it remains dangerous does not yet exist. 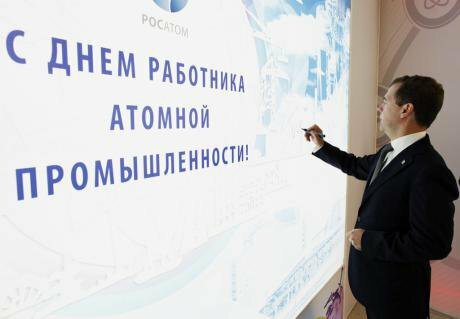 Dmitry Medvedev on a working visit to the Volga Region, organising a presentation with Rosatom, 2011. Photo CC: Dmitry Astakhov / Visual RIAN / Commons. Some rights reserved.Ibragimova: Evacuation plans for accidents at nuclear facilities, or during the transport of radioactive materials, are very important. People have the right to know what to do in such cases, and the authorities don’t properly inform the population, so as to avoid the issue of risk entirely. As part of the Russia-wide campaign #Chernobyl30, we’re holding “Chernobyl lessons” in the schools and universities of Voronezh, where we ask participants to create their own action plan in the case of a nuclear emergency. In most cases, the participants don’t understand what to do, don’t know where emergency shelters are located, and haven’t a clue where to find the information. That’s a huge problem. A well-informed citizenry on this issue will surely lead to a higher level of organisation during an emergency, thereby resulting in fewer victims. Furthermore, we’re trying to develop projects on this difficult topic, particularly at the intersection of ecology and art. For example, on 19-21 April in Moscow and St. Petersburg, we organised a staging of a documentary piece, Chernobyl by the Kryly Halopa [Ru: wings of Halopa] theatre, with an accompanying discussion on the problems with nuclear energy. We are also holding a commemoration in Voronezh for the 30th anniversary of what was the largest nuclear disaster in history. Vladimir Slivyak: But first of all, we need to explain to the population that atomic energy isn’t just about reactors and the possibility that they might explode. It’s also about nuclear waste, which can remain dangerous for thousands of years, and must be paid for by many future generations of taxpayers. Humanity has never faced a problem of this scale, which will continue to have negative consequences for many centuries to come. It’s a difficult problem to come to terms with, because humans tend not think so far ahead. But this has to be dealt with on that scale, because the energy that we use up today and the profit we spend today, will result in a whole legacy of problems for those who live a thousand years after us. Society needs to discuss nuclear waste. We have to stop producing it. oDR: How can you encourage an alternative education about Chernobyl and the ongoing dangers of atomic energy in Russia, particularly for those who are getting acquainted with anti-nuclear activism for the first time, and know very little about the history of Chernobyl? What does Chernobyl+30 plan to achieve? Vladimir Slivyak: The public must be reminded at every opportunity about the tragedy which happened 30 years ago, and that the government made the wrong decision. Life changed dramatically for millions of people, and that’s not even mentioning the economic losses and radioactive contamination. Actually, Chernobyl made a radical impact the nuclear industry itself — many countries stopped developing atomic energy entirely, and those who were considering developing it had to scrap their plans. Essentially, the nuclear industry has never emerged from the post-Chernobyl crisis. Nevertheless, lobbyists for the nuclear industry attempt to convince the young and those who don’t know their history that there is nothing to worry about. Nailya Ibragimova: For our part, we are subjected to serious pressure from the authorities, not even with the aim to punish us, but instead to force us to spend our resources on anything but the dangers of “good old nuclear energy” and the need to change the direction of development of the energy sector. As a result, we have to pool our efforts into withstanding their attacks, attending court hearings, finding the funds to pay various fines, and so on. But if we allow people to forget the real timeline of events, then suddenly another Chernobyl could happen, then another, and then one more. Education is needed so that the same mistakes aren’t made in the future. We cannot allow history to be rewritten and for the public to have distorted image of the past, because somebody wants to earn more money from nuclear energy, and criticism gets in the way. Chernobyl+30 is directed against forgetting. To remember is to fight! 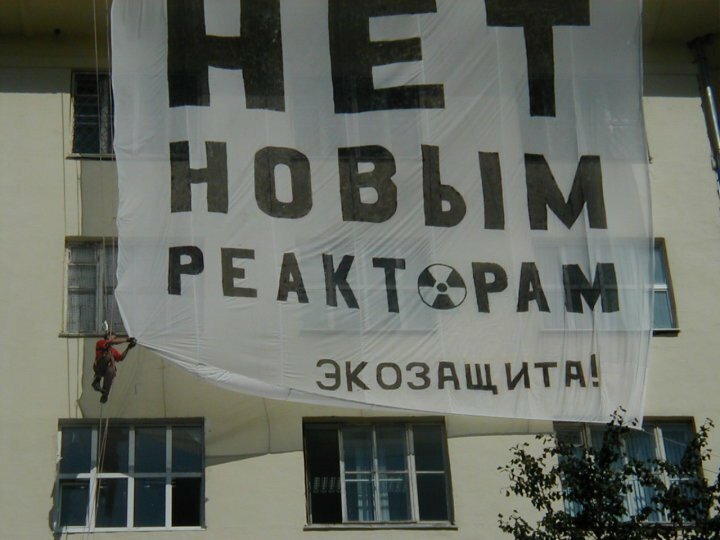 Standfirst image: "No to new reactors" action in Ekaterinburg, 2005. Credit: Ekodefence!